In the recent past the relocation industry has seen a massive rise in its popularity. The constant demand of movers has led to the appearance of many companies, some with dubious skills and experience. Avoid making the mistake of hiring the wrong people by relying on the excellent services that Removal 24 provides in South East London. We are a company that has been around for long enough to see the actual rise of the sector and how it has affected already established professionals in it. What we have that other such companies lack is the skills and experience that we have accumulated over the years, as well as our expansive material base. Since our company would amount to nothing if it wasn’t for our dedicated workers we take great care when we select them. Not everybody gets a chance to be in our vetted team, in fact, only those who show ambition, skill and care during the selection process are considered. Should they make it in what fallows is an extensive training process. It involves the apprehension of multiple skills that will later be useful for their vocation. In effect they become masters of all thing moving related and much more. For us going cheap is not an option. Due to our numerous happy clients we can afford to provide our workers and by extension our customers with the highest quality materials available in SE. Our excellent packers and handle your belongings using only top quality packing materials. This way our work is both safe and eco-friendly. The lorries and loutons we use are all new, well equipped and excellently maintained. Comfort is, after all, the main reason why clients come to us in the first place. We have taken all measures possible to ensure that our clients receive the most affordable and easily accessible moving solutions possible in South East London. We start by removing any doubts about the safety by offering full insurance. This is followed by being available constantly so that even the busiest of clients get the chance to make use of our services. Lastly our prices are calculated solely based on the difficulty of the work. While we specialize in moving there is plenty of other related services that we can offer. Hiring them in conjunction with our relocation team or other such jobs saves you a lot of time and money on average. A good example for the supplementary work we do would be our packing supply delivery service. You gain access to our packing supplies of impeccable quality without our team or our vehicles if you have the means to transport and pack them yourself. We work with a well-customised agenda which is why we are renowned for our flexibility. This not only means that we will carry out your property removal in South East London at a day and time that suits you best but that we can also accept same day jobs and conduct late night operations. The last is highly appreciated by our business customers as it means that we can complete their relocations without cutting their ongoing deals. London has been a location of importance since the dawn of mankind. It has been a gathering place for prehistoric hunters, a fort for roman and a settlement for local tribe. With the Norman invasion the city became the capitol of the kingdom and began to flourish. It has always had a welcoming attitude towards immigrants throughout its history. This has led to its population of eight and a half million people who form a culturally diverse society. London is officially divided into ever smaller regions but the largest division is the one by the river Themes, which spits it into North London and South London. Greenwich is certainly the most famous borough in South East London. It is the location of the Greenwich Observatory which was built in 1675 and currently serves the purpose of a museum. Along with the Royal Naval College, the observatory is recognised as a World Heritage Site by UNESCO and is one of the city’s most visited landmarks. South East London is also home to a number of internationally known museums such as the Tate Modern, Imperial War Museum, Dulwich Picture Gallery, London Fire Brigade Museum and more. Every business has a different strategy, timetable and targets which is why we have recognised the importance of providing our clients with customised commercial moving services in South East London. Is your business small or do you own a large chain of commercial properties? For us, the answer to that question does not really matter because our experienced movers in South East London can do both. What is more, our careful and remarkably attentive staff enjoys free access to innovative moving equipment and fully serviced transit trucks and vans. 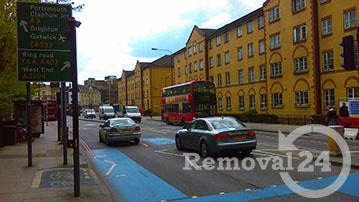 We, at Removal 24, try to make every aspect of our cheap commercial removal services in South East London more hassle-free for you – our customers. This is why our polite and certified consultants can help you calculate your moving costs. In addition, we will offer you a custom-tailored quote which will be crafted specially for you, your needs and your current financial abilities. If circumstances are forcing you to complete your office relocation on a weekend or even in a matter of a few hours, we from Removal 24 can make your moving experience smoother and more time-efficient through our additional options which include green end of tenancy cleaning and waste collection. We can even deliver you packing materials and moving boxes or send you some of our vetted packers. South East London is that part of the English capital which includes the London Boroughs of Bromley, Southward, Lewisham, Bexley and Greenwich. It is estimated that its population has now reached approximately 1.3 million people. South East London is incredibly leafy and it tends to be affordable which is why young families love it so much. Many spots in this region have clusters of beautiful and old Edwardian and Victorian properties and function as protected areas.